It was an artists dream, witnessing the spectacular colors in the early morning sky changing by the second. With the rising sun, colors changed vividly and continually. 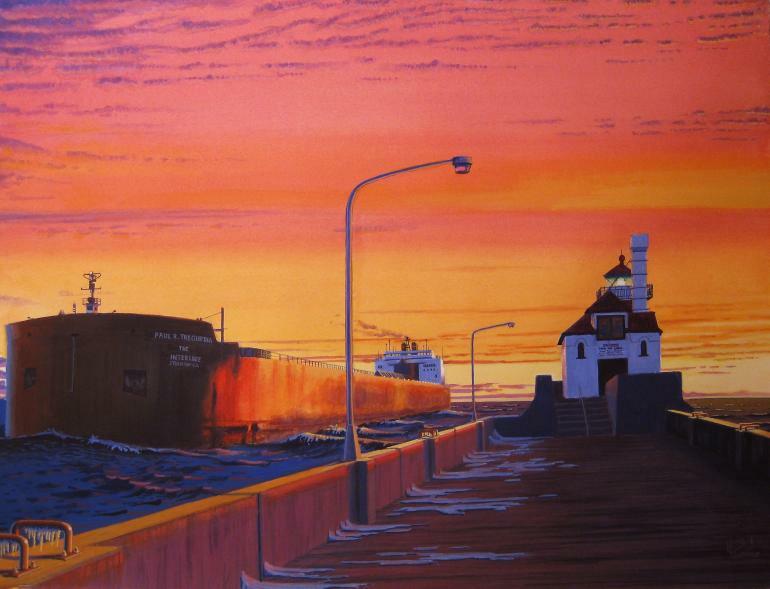 Adding to the striking kaleidoscope of colors was the entry into the Duluth Ship Canal of the longest ship sailing the Great Lakes, the 1013 foot M/V Paul R. Tregurtha. If this all wasnt dramatic enough, adding to it were 3 resonating blasts, the Masters Salute of one long and two shorts, from the Tregurthas whistle. As the vessel passed the South Pier Lighthouse and headed toward the Aerial Lift Bridge, the Bridge returned the Salute. Only small amounts of snow had fallen so far, it was December 17, 2002 as the enormous vessel was coming in to load about 60,000 tons of low sulfur western coal, much less than its 68,000 ton capacity, at the Midwest Energy Terminal in Superior, WI. In about 12 hours the ship would then be downbound for the electric generating plant at Detroit Edison on the Detroit River, three days away.